Building on the release of its larger Next Generation excavators, Caterpillar has launched a new range of 1- to 2-tonne Next Generation excavators for smaller construction jobs. Sydney-based Greenstyle landscapes has experienced their power, as the first owner of a 301.7CR Next Generation Mini Excavator in Australia. 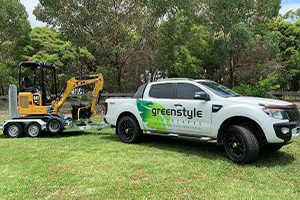 Servicing Sydney’s residential landscape sector with its diverse construction offering for the past 10 years, the vision of Greenstyle Landscapes and its owner Ryan Allen is clear: to create quality lasting outdoor spaces to suit the needs and desires of their clients. As a multifaceted business believing in quality over quantity, the North West Sydney-based firm has earned a reputation for excellent customer service, communication, workmanship and a high-quality finish. Before this year, Mr. Allen says the business had always rented machinery for its projects, but he felt the time was right to move into plant ownership, citing the long-term benefits of ownership outweighing short-term rental. He began conducting his own research into finding the right mini excavator for the business and approached WesTrac Cat, looking specifically at the 301.7DCR as there were good deals on offer and he knew Cat was a strong brand worth looking into. However, when WesTrac Cat mentioned the new “next generation” models Cat was about to release and the impressive advancements made on them for mini excavators, it piqued his interest. This prompted him to attend the machine launch event at the National Construction Equipment Convention in Sydney last year. Officially unveiled to the Australian market at the show in November last year, the Next Generation line-up of mini hydraulic excavators, fully designed, powered and built by Caterpillar, are bringing advancements in comfort, performance and power. The new models include the standard tailswing 301.5, 301.6 and 301.8 mini excavators that give the best digging and lifting performance possible in a small machine package, as well as compact radius 301.7CR, and 302CR for working in tight spaces. All models marketed in Australia come with expanding undercarriage and range from 1630 to 2200 kilograms, depending on machine configuration. What makes these new models so different from what’s been seen in Australia before is the investment the manufacturer has made in developing advancements into its smallest machine packages. Through repeated customer input and feedback sessions around the world, Cat has prioritised the customer and operator in the design philosophy of its latest machines, resulting in several industry-first features exclusive to this excavator size class, including its stick steer system, which allows the operator to switch into travel mode at the press of a button. An air-conditioned cab, tilting canopy or cab and a Bluetooth key with push-to-start button also help take the machines into the realms of the “next generation” while emphasising operator comfort, safety and usability. Opting for the new 301.7CR, Mr. Allen is the first in the country to own a machine in Cat’s new mini hydraulic excavator range. Having used the machine now for just over a month or two, Mr. Allen says he hasn’t had the opportunity to put it through its paces yet, but it’s a case of “so far, so good”. Another aspect he’s excited about is the ability to change the hydraulic settings from the monitor. “There are two of us who mainly use the machine and we have different styles of operating. The ability to go into the monitor and increase or reduce hydraulic response gives us a machine we both love using and matches our personal preferences,” he says. Experiencing the power and productivity of the new mini excavators firsthand, Mr. Allen knows well the benefits the new Cat range is bringing to business owners like himself and other contractors in the market. Based on his experiences, he is also highly recommending the machines to others. “More than that, I’ve already helped with a couple more sales for WesTrac Cat. I’ve met with a couple of other local businesses, one a landscaping business and another a plumbing business, who came by to ask me about my 301.7 and about dealing with WesTrac Cat, which have been great for me,” he says.